This Rhubarb Sauce Recipe is a quick, easy way to make the most of that Spring rhubarb! It’s tart and sweet and perfect over ice cream, cake, vanilla yogurt or pancakes for breakfast. Includes variations: strawberry rhubarb sauce, blueberry, and more. 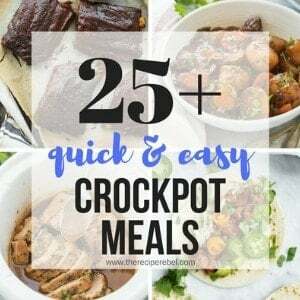 With step by step RECIPE VIDEO you can follow along. I know that with rhubarb, there are those who love it and those who hate it, and there aren’t many in between. Me? I used to be a rhubarb hater. As a child. “tart and tangy” and “dessert” just don’t mix. But as I’m now a fully grown adult who loves dessert of all kinds (well, except pumpkin! ), bring on the rhubarb sauce! Here in Manitoba, rhubarb is just popping up and isn’t really ready for use yet (and if you are in Manitoba and you have some, send it to me! I’m itching to get my hands on some). 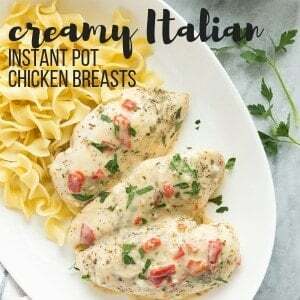 I had to use frozen rhubarb to make this sauce, but the great thing is that it works equally as well either way, since it’s going to be cooked down until it’s tender in the end anyway. If you’re looking for more rhubarb recipes, try these Strawberry Rhubarb Crisp Bars or this Rhubarb Cake. 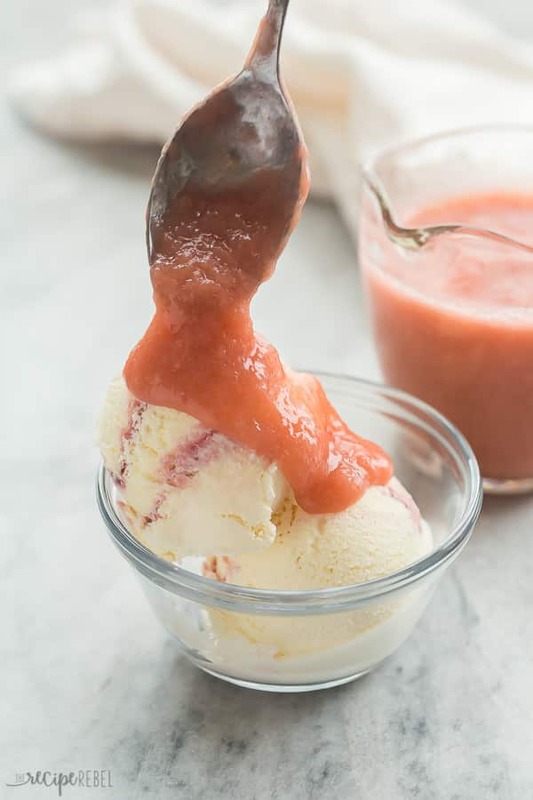 Like most fruit sauces, this rhubarb sauce is really easy to make. It’s one of the easiest ways to use that summer fruit to make a delicious, homemade dessert in no time. There are lots of varieties of rhubarb around here — some are bright pink and some are more green. The color isn’t a reflection of flavor and you can use either green rhubarb or pink in this recipe. In this rhubarb sauce recipe, the rhubarb is simmered with a little bit of water and sugar until tender. If you want to punch up the flavor, try using apple juice or another liquid instead of water to keep things interesting. Smooth or chunky: once the rhubarb is tender and your sauce has thickened, you can either serve as is or take an immersion blender to the pot and puree until you reach your desired consistency. I like mine smooth! To make Strawberry Rhubarb Sauce, simply swap half (or more or less!) of the rhubarb with fresh or frozen strawberries. Cook the fruit down just as you would otherwise, and puree or leave it chunky. 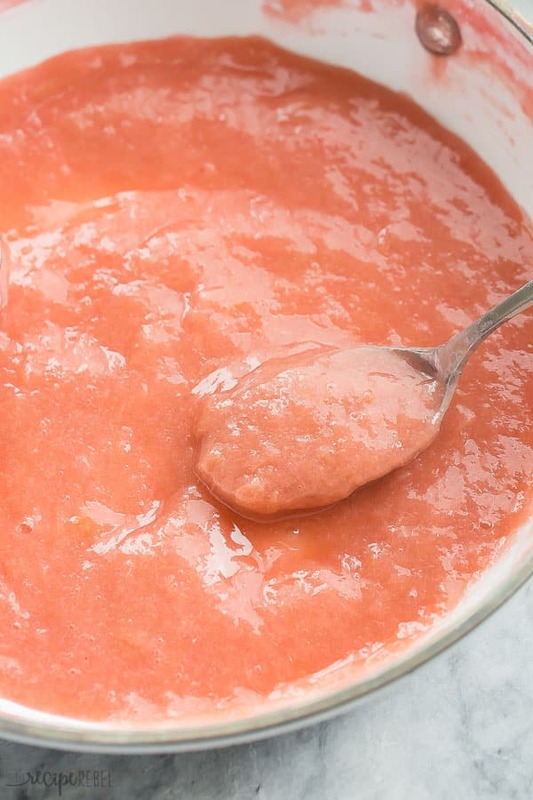 Can you freeze rhubarb sauce? 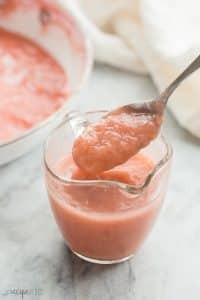 You can absolutely freeze rhubarb sauce! 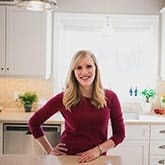 When I’m making a fruit sauce, I love to make a large batch and freeze in small freezer bags or containers to take out when I need a quick dessert or a topping for waffles on the weekend. Be sure to cool to room temperature before pouring the sauce into a freezer bag and freezing. Watch the recipe video for this easy Rhubarb Sauce recipe! This Rhubarb Sauce Recipe is a quick, easy way to make the most of that Spring rhubarb! It's tart and sweet and perfect over ice cream, cake, vanilla yogurt or pancakes for breakfast. Includes variations: strawberry rhubarb sauce, blueberry, and more. With step by step RECIPE VIDEO you can follow along. In a medium pot, add the rhubarb, 1/2 cup water and sugar. 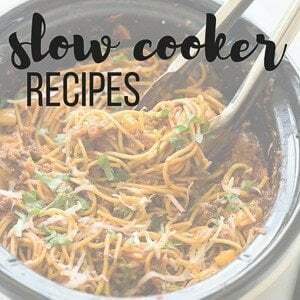 Bring to a simmer over medium-high heat and reduce to medium-low. Simmer for 5-10 minutes, until rhubarb is completely tender. Puree with an immersion blender or mash with a potato masher if desired, or leave chunky. Taste and add additional sugar if desired. Combine equal parts corn starch and water and stir into the hot sauce, whisking constantly until thickened. Continue gradually adding corn starch mixture until you reach desired consistency.